Downloading your collection of data stored within Google products can be a tedious job, especially when you have been using Google for years across many different applications. With hundreds of files and photos already uploaded, downloading them one by one is hardly an idea worth considering. Instead of scrolling and surfing page after page of your Google accounts and downloading each file, one after the other, be it the data and files from Google Docs, Google+, Buzz, contacts or even your photo album on Picasa, consider the alternative: Google Takeout. 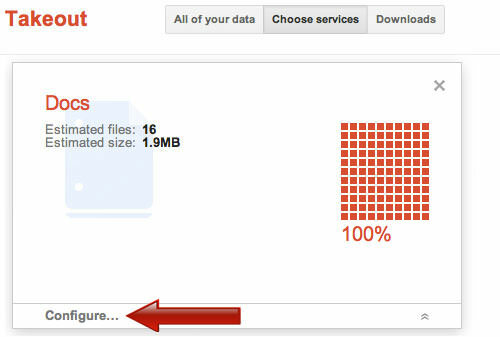 Takeout is a web application provided by Google, specifically to let you access all of your data stored within Google products, and to download all of it at once. This tutorial will guide you on how to access your stored data and download it to your computer. 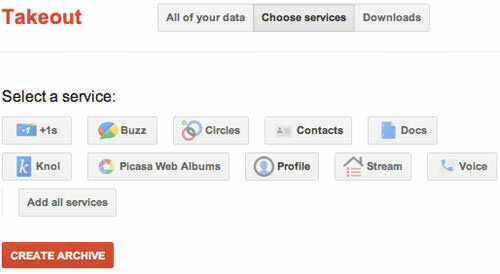 To start downloading your data, go to Takeout and log in with your Google account’s username and password. You will need to log in again although you have already logged in to your account from a different Google product, as this is extra protection for your data. To download data from a specific Google product, simply click on the link ‘Choose Services’ and you will be given another list of product. Now click on any one or more product to download the data. When you click on any one product, Takeout will present something like a ‘digital card’ with insight to files you’re about to download. You will be shown a number of files and the estimated total size. 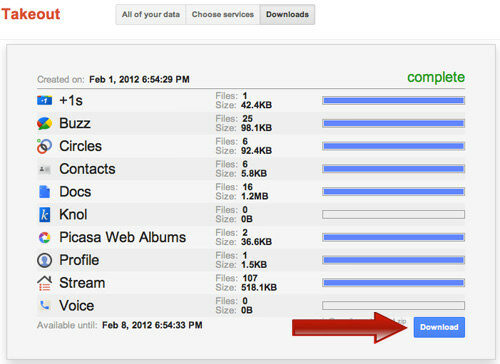 Now click on the ‘Configure…’ bar to check or change the file format before you proceed to download. You will be given an option to change your file format. Simply click on the dropdown menu of each file type to change the format, and click on ‘Create Archive’ to start the download. 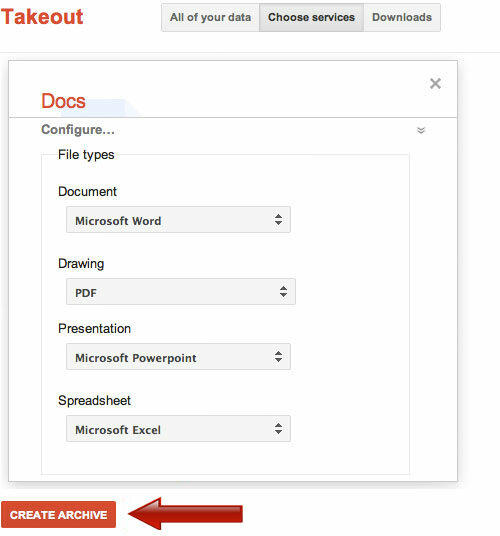 After you click on the ‘Create Archive’ button, Takeout will start preparing your files. How long this step takes depends on the size of the files within. Once it is completed, click on the ‘Download’ button to download your files into your computer. If you choose to download all the data from all the Google products you have every used all at once, click on the ‘Create Archive’ button, as shown below. Once clicked, Takeout will automatically process your files for downloading, without the option to change the file format. When the process is complete, click on the ‘Download’ button to proceed. Your downloaded data is organized in one root folder in zipped format. 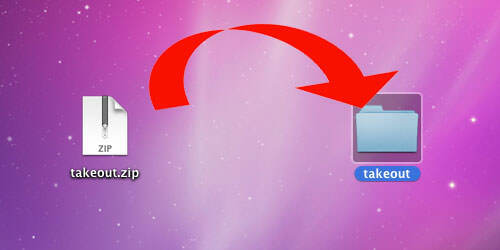 To open your data and files, simply unzip the folder. If you download data from more than one Google product, you will see a number of sub-folders, and these sub-folders contain your files as kept by Google. We have been using Google products for years across many web applications and knowing that, the number of our files stored in Google may have increased beyond a measly few hundreds. Therefore when we need to check or download these files, it starts becoming a hassle. 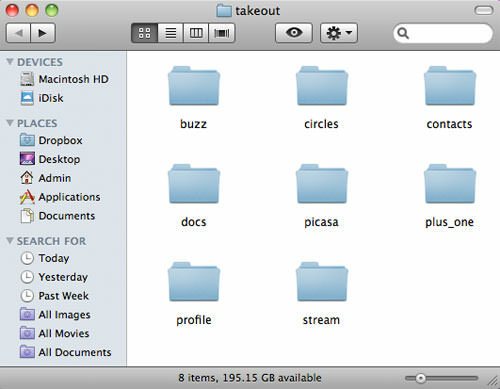 Takeout has made the process of downloading these files much simpler.